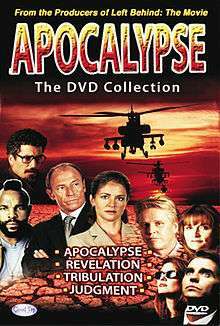 Apocalypse is an eschatological science fiction-thriller film franchise written and produced by brothers Peter and Paul LaLonde, the makers of the similar Left Behind series. Like the latter, the films were and produced and released by Cloud Ten Pictures. It focuses the events that take place during the Great Tribulation period after the Biblical Rapture. Although there are four films in the series, the only end-time events that are depicted in them are the Rapture, the War of Ezekiel 38-39, and the Mark of the Beast. The series' primarily follows characters Helen Hannah (Leigh Lewis), a reporter who becomes an Evangelical Christian following the rapture, and Franco Macalousso (played by Sam Bornstein in the first film, and Nick Mancuso in the following three films), the Biblical Anti-christ that claims to be the messiah and is the chancellor of the O.N.E. (One Nation Earth). Other cast members include Jeff Fahey, Gary Busey, Carol Alt, Tony Nappo, Howie Mandel, Margot Kidder, Corbin Bernsen, and Mr. T. The films were released direct-to-video between 1998 and 2001. There are four entries, not including a planned but ultimately cancelled fifth film. The films have generally received mixed-to-negative critical reception. The first film in the series, released in 1998. Bronson Pearl (Richard Nester) and Helen Hannah (Leigh Lewis) are award-winning journalists caught in a frantic race against time to alert the world of the deadly deception of Franco Macalousso, President of the European Union. Pearl, a hard-bitten skeptic, at first refuses to listen to Helen Hannah's concerns. But as the evidence mounts, he realizes they must not only run for their lives, but their eternal souls as well. Pursued by agents of O.N.E. (One Nation Earth), they race to uncover a power so evil that the very souls of humanity are at stake. Three months have passed since the events of the previous film. The leader of the world Franco Macalousso (Nick Mancuso) has convinced many of those left behind that he is the true Messiah, or is he? Counter-terrorism expert Thorold Stone (Jeff Fahey) tries to put the pieces of his life together. His wife and daughter were among those who vanished. In the course of his investigation of an underground resistance movement, he discovers a conspiracy that leads right to the heart of the new global order. With the help from a group of underground Christians, led by Helen Hannah (Leigh Lewis), a computer geek (Tony Nappo), and beautiful blind cynic (Carol Alt), Stone finds himself in a race against time. The World Government of One Nation Earth (O.N.E.) is distributing virtual reality headsets to everyone on earth. What are they, and what will happen when the world puts them on on the "Messiah's Day of Wonders"? As the investigation continues, Stone discovers a sinister plot that only he can stop. But to do so, he must first decide who he believes in. This film is set before Apocalypse, and two years after the previous film Revelation. Tom Canboro (Gary Busey) is a police detective who finds himself battling on a mysterious group with psychic powers. When his wife (Sherry Miller), sister Eileen (Margot Kidder), and brother-in-law (Howie Mandel) become the target of this dark society, he rushes to their aid. However, before he can reach them, a mystical force takes control of his car, and he crashes into an oncoming truck. When he wakes up from his coma, he finds himself in a world that has gone through a very frightening transformation. Tom, confused, barely escapes from the hospital, and he tries to look for his family, as well as trying to find out what's going on. All Christians have vanished in the rapture, and 95% of the world worships the anti-Christ Franco Macalousso (Nick Mancuso), and wears a 666 mark on their right hand, and those that refused to take the mark were killed by Macalousso. Meanwhile, Helen Hannah (Leigh Lewis) and her resistance group tries to expose Macalousso as the devil himself! The Supreme Court vs. The Supreme Being. Let the Trial Begin. Supreme leader of One Nation Earth Franco Macalousso (Nick Mancuso) rules the world with an iron fist. His long-time nemesis Helen Hannah (Leigh Lewis) has been charged with crimes against humanity by the World Court, and Mitch Kendrick (Corbin Bernsen) is the troubled, reluctant lawyer assigned to defend her. Prosecutor Victoria Thorne (Jessica Steen) is not only Kendrick's ex-lover but a high-powered attorney with a ruthless ambition to condemn all Haters. She has arranged that the verdict will convict Hannah if the trial's pre-written script is closely followed by Mitch. But as Mitch digs deeper into the evidence and begins to doubt his own beliefs, he decides there's only one way to uncover the real truth.... to put God on trial! Meanwhile, Hater J.T. Quincy (Mr. T), and the haters come up with a plan to rescue Hannah.